Browse Wedding Guide for more articles like this. The Luckenbach Dancehall has hosted country legends such as Waylon Jennings, Willie Nelson, and Kris Kristofferson. It can also host the perfect indoor wedding. Courtesy photo. Choosing the perfect venue can be the most exciting, and most frustrating, part of wedding planning. The Texas Hill Country has a variety of indoor venues for every taste. From hosting a reception in an underground cave to a pavilion with panoramic lakeside views, the possibilities are endless and unique. Here is our list of the best indoor wedding and reception venues in the Highland Lakes. Forget about installing a dance floor; choose a down-home Texas dancehall as your indoor wedding venue. 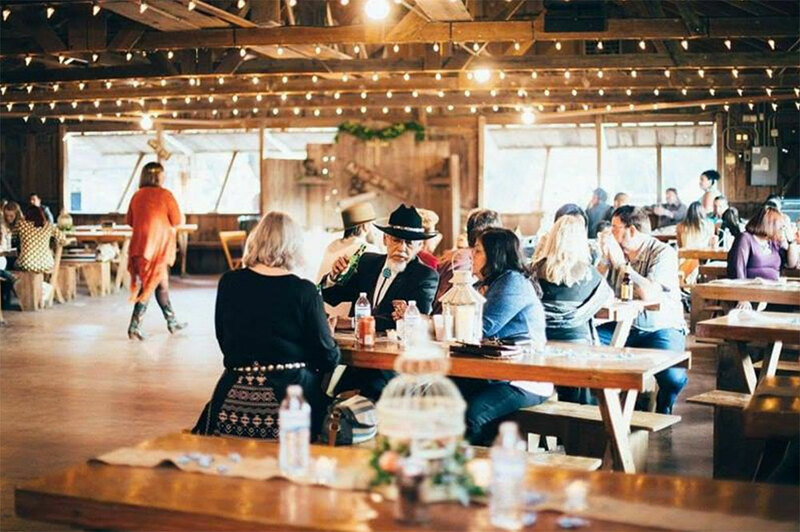 Lauded by country legends Waylon Jennings and Willie Nelson, Luckenbach Dancehall serves as a perfect wedding venue with a historic Texas flair. Go even further and rent out the entire town of Luckenbach to tie the knot Texas-style. Also, consider Cadillac Dance Hall, the “Best Little Dance Hall in Texas,” located in Marble Falls. The venue is on a 500-acre ranch with breathtaking Hill Country views. For the quirky brides and grooms, plan a wedding that will never be forgotten in these unique venues. Longhorn Cavern State Park can accommodate your wedding party at 135 feet underground. As an added bonus, the cave is a comfortable 68 degrees year-round and can serve as a summer or winter wedding venue without the worry about weather or extra heating or cooling. Take your wedding location to the silver screen and get married in a historic movie theater. The 1940s Uptown Art House in Marble Falls, the 1935 art deco Globe Theatre in Bertram, and the freshly restored 1927 LanTex Theater in Llano all serve as one-of-a-kind venues in the Texas Hill Country. You don’t need to be reminded that it gets hot in Texas. Some might want to have a wedding that starts outdoors and brings the reception inside — or vice-versa. The Retreat at Balcones Springs in Marble Falls has two indoor spaces of different sizes as well as a rose garden, a pavilion, and a gazebo. Log Country Cove offers its Cedar Skies Event Center, sprawled across 170 acres of land alongside Lake LBJ. Get married in the beautiful barn at Heart of Texas Ranch in Marble Falls. Heart of Texas has numerous glass doors that can be left open for a true indoor/outdoor feel. Lakeside Pavilion in Marble Falls has an ample banquet room with a pavilion overlooking Lake Marble Falls. For those planning a destination wedding in the Texas Hill Country, choose a place where every guest can stay the night. For luxurious indoor spaces, choose Horseshoe Bay Resort on Lake LBJ. The Granite Ballroom, Palm Pavilion, Yacht Club Ballroom, and Stone House can host weddings with up to 12,000 guests. The resort has 400 guest rooms, suites, and condominiums. Thunderbird Lodge & Event Center provides outstanding views of Lake Buchanan with 23 lodges from luxury log cabins to charming cottages. Located on the edge of Lake Marble Falls, La Quinta Inn and Suites has a beautiful 2,000-square-foot banquet room and 73 guest rooms. Crockett Hall at Willow Point Resort will charm your guests in a casual setting off Lake Buchanan with lodging for approximately 100 guests. Vineyards in the Hill Country are incredibly scenic. These tasting rooms offer intimate spaces for your wedding and reception venue. Torr Na Lochs in Burnet has a picturesque tasting room perched atop a hill overlooking the Colorado River valley. Perissos Vineyard and Winery in Burnet has a barn-style tasting room with barrels of wine serving as a backdrop. Whether cave or cozy cabin, Highland Lakes wedding venues can be tough to choose among. Better get started making those on-site visits now!